Songs can have great manifestation power through their intention, words and sound. 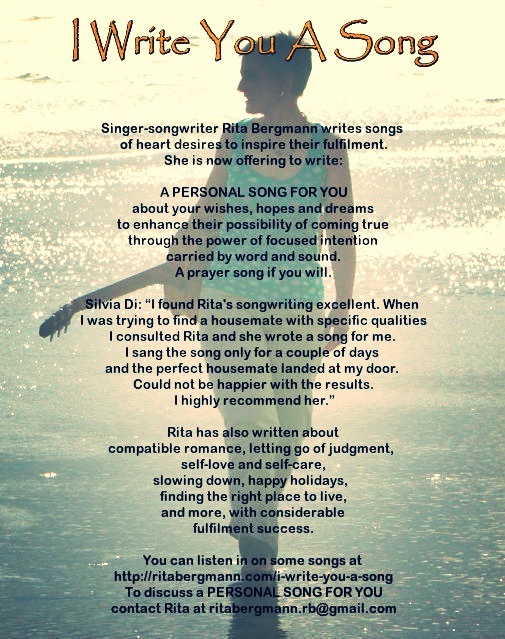 I have been writing songs for more than ten years to help me fulfill my heart desires like increased mindfulness, self-love and self-care, appreciation of life, trust in happy outcomes, setting healthy boundaries, perfect romance, living in my dream home, and more with lovely results. The outcomes happened over time but they happened and still are happening for me. I feel very passionate about what I do and I’m delighted to offer to write songs for other people and their wishes (in English or German language). 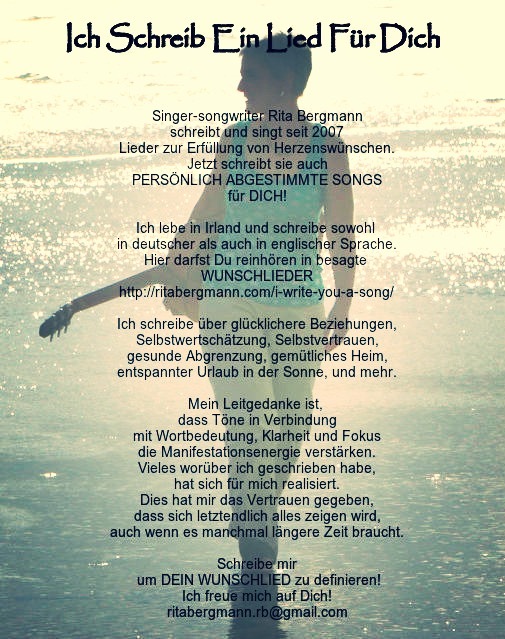 If you would like me to write a song for you contact me at ritabergmann.rb@gmail.com to discuss the details. We can have a chat in person or via voice or video call where you tell me what you want in the song, and where we bring your heart desire into clear focus. It will then take me about a week to put your song together. I will record it on the i-phone with vocals and guitar and send it to you in an email. I can also burn a CD on request. When you are happy with the song you can give a donation via paypal of an amount that you feel the song is worth to you and according to your financial circumstances. The essence of the song will continue to be amplified any time you listen to it, sing it, and when I sing it at home or to an audience which I would be happy to do if you were happy with it too. Below is a testimonial and a video of a song requested. The video below, ‘It Just Is’ was requested by someone looking for more self-appreciation and joy in their life. Disclaimer: I can’t of course guarantee the desired result but people respond with great delight about the songs I write for them.